There is nothing in this world like spending a night in your own bed after 10 days away — and waking up to news that is not just Good News, it’s downright TERRIFIC. That’s this Saturday morning for The Legal Genealogist — and the news out of the Peach State is WONDERFUL NEWS for the entire genealogical community. • Opening to the public on Wednesdays and Thursdays beginning July 31. Weekly hours will be Wednesdays-Saturdays, 8:30 a.m.-5 p.m. Starting 31 July, the Georgia Archives will be open four days a week, Wednesday-Saturday, 8:30 a.m. – 5 p.m.
Talk about moving in the right direction!!! 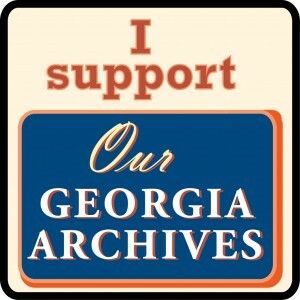 A big THANK YOU to the Georgia Legislature for acting responsibly to conserve and protect this critical repository of priceless records of our common past, to the University of Georgia System for its support of and commitment to the Archives, and to all the genealogists in and out of the State of Georgia for their untiring efforts to save the Georgia Archives for us all. Oh, that is wonderful! Hooray for everyone involved, including the volunteers from the Georgia Genealogical Society! You know this is still a democracy (sometimes I wonder) when a principled, well-informed public outcry can bring about reform and change! Makes my day. The support from the Georgia University system folks has been terrific as well.